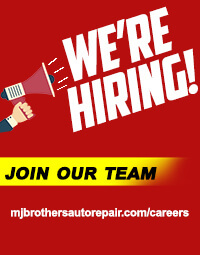 MJ Brothers Auto & Truck Repair in Raleigh, NC is well known as a less expensive alternative to Auto Dealers. In many cases, we are working with the same equipment as the dealers. We’ve been here since 2010 performing top quality auto service to most models of cars, trucks, SUVs, Sprinter Vans and more. We specialize in Fleet cars and trucks and work with all the fleet management companies providing fast, high-quality repairs. Our team of ASE Certified technicians is obsessed with training. We study the latest from this automotive field. We have hundreds of hours of advanced training that keep us abreast of all the latest technologies and service techniques. We have a sincere passion for keeping vehicles safe and on the road. Our high-quality work and outstanding personal customer service are what separates us from other repair shops. In addition we utilize modern technology with texting, emails, and electronic approvals. We understand that you purchased your vehicle to be out on the road making money, picking up and dropping off your kids, recreation, etc. We respect your time and we realize that you need it back. Our team always wants to exceed your expectations . So we have invested in the training and on the vehicle experience to make this possible. 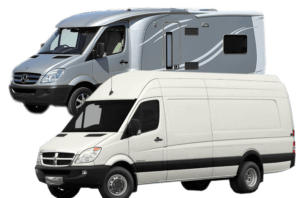 We are Sprinter Van specialists, working on all older models from 2002 to the newest Dodge-Freightliner and Mercedes models. You can depend on your Sprinter Van to keep your business productive, in motion, and on schedule. If you’re using your Sprinter for planned recreation, our team will ensure safe operation. Allow us to do a Preventative Maintenance service for you( PM). This gets you our experience and training to keep your Sprinter Van on the road. We check all safety points and we check for upcoming repair needs and maintenance. At MJ Brothers Auto & Truck Repair, quality customer service is just as important as quality auto service. Think about your last trip to an auto repair shop. No matter what the results were of your appointment, you remember how you were treated more than anything. Our shop doesn’t treat you like just another number. That’s why we believe we’re preferred over the dealers’ impersonal and expensive services. We treat our customers like family, and we want to add you to our current family of customers. We’re never satisfied unless you’re happy with the auto services you receive. We stand confidently behind all of our auto and truck repairs with competitive warranties on all services. Let our team show you a higher standard for quality auto service and repairs. Motorists throughout Raleigh, NC are welcomed to our state-of-the-art facility. Give us a call today at 919-521-5101 to schedule your next auto or truck service appointment. Save time by scheduling right now since you’re already online. Next time you’re in the area–1408 Wilders Grove Lane–feel free to stop by today with any questions or concerns about your car, truck, SUV, or Sprinter Van. We are truly pleased with the service at MJ Brothers. I am the fleet manager for Michael and Son Services and with our demand of services needing to be done in a timely manner, Rob and the brothers have gone above and beyond to make sure we are treated like VIP customers. The new facility looks amazing and we are truly grateful for the service your guys offer to us and the community. Thank you for all you do!